Jeff Norrell was a featured speaker on August 24 at the Tuskegee Human & Civil Rights Multicultural Center in Tuskegee, Alabama, at a conference marking the 50th anniversary of school desegregation in Alabama. 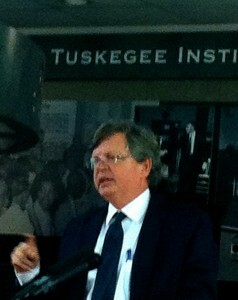 He addressed a large audience on how the civil rights movement in Tuskegee fit into the larger movement for civil rights. The author of Eden Rise, a novel set in Alabama in the 1960s, Norrell also addressed the conference on writing civil rights history as fiction. He commented on the relationship between fact and fiction, how fiction reaches more readily for historical truth, and the relationship between the author’s own life and the narrative he presents. Jeff Norrell holds the History Department’s Bernadotte Schmitt Chair of Excellence.